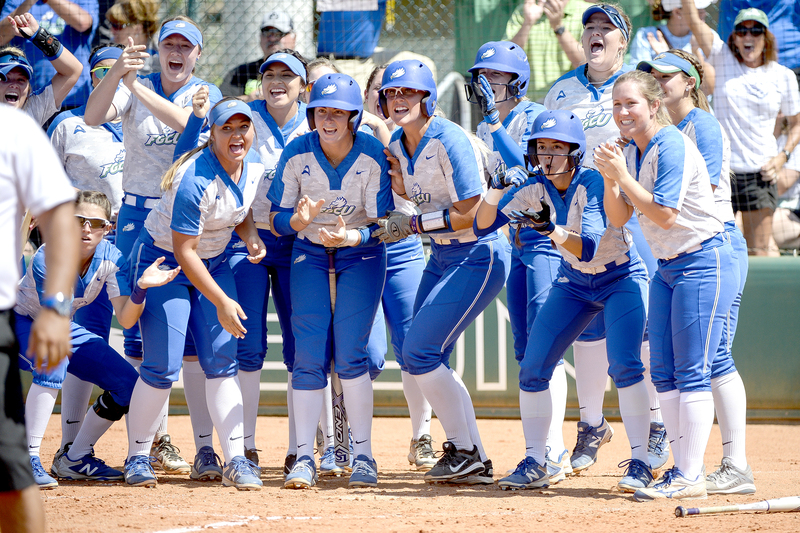 Ahnie Jumper’s first collegiate softball season concluded May 11 when Florida Gulf Coast University was bounced out of the ASUN conference tournament in DeLand. Jumper is one of the few athletes in the history of the Seminole Tribe to play for an NCAA Division I sports program. “It’s a really good opportunity to better yourself,” she said. FGCU had plenty of success along the way to posting a 39-17 record, marking the program’s most victories in a season since 2012. The Eagles were tough to beat at home, winning 20 of 26 games in Fort Myers including a doubleheader sweep against the University of South Florida. On the road, FGCU aced a road trip to California by going 6-0. The Eagles also went toe-to-toe against Oregon in two games at Florida State’s tournament in March. The Eagles essentially held their own against the nation’s No. 1 ranked team for 12 of the 14 innings in a pair of losses to the Ducks. Jumper wasn’t one of the 18 players that FGCU took for road trips in the first half of the season, but by the second half she had earned a spot on the travel roster. “I worked hard and made the travel team the rest of the season,” she said. FGCU coach Dave Deiros said next season’s out-of-conference schedule includes spring break games in San Diego. In May, FGCU was the No. 2 seed in the ASUN tournament and won its opener, 6-1, against USC Upstate, but then dropped two in a row the next day to end their conference title hopes. They did not receive an at-large invitation to the NCAA Tournament. Jumper had to adjust to a new role this season. After being a key starter in high school the past few years for American Heritage’s powerhouse program in Plantation, she didn’t see much playing time as an Eagle freshman. “I knew coming in it would be hard. The best nine play and this year I wasn’t one of the best nine, but I played other roles,” she said. Jumper didn’t make any trips to the plate, but she made the most out of her role as a frequently used pinch runner. She scored eight runs, including the winning runs against Stony Brook and the University of Connecticut. She stole one base, which came against Southern Illinois. Jumper saw very brief action in the field as a backup third baseman behind senior starter Brittany McGuire. “As it happened, the senior got the starting job and was healthy all year long, so there weren’t a lot of opportunities to get her into games at third base,” Deiros said. Jumper’s position next season will likely be as a catcher, which was her primary spot in high school. Jumper is the great-granddaughter of the late Seminole leader Betty Mae Jumper, the first and only woman to lead the Tribe as chairman who also was a pioneer in several fields for the Tribe such as health, education, cattle and journalism. Ahnie Jumper’s career goal is also to give back to the Tribe. The Elementary Education major has aspirations to become a teacher within the Tribe. She’s already got a head start in certain areas. Last winter, she gladly shared her skills and knowledge with Tribal youngsters during a softball clinic with other FGCU players and coaches on the Brighton Reservation. One difference between high school and college that has benefited Jumper is a far shorter commute. Instead of driving an hour each way between Big Cypress and American Heritage, now she only needs a few minutes to walk to class. “It’s easier for managing school and softball,” she said. As for the team, Jumper said one of her goals next season is to earn a starting spot.